Sapong said of the game, "You can't really put it into words, man. It's been a long, long hard-working road for us to get this first win. There's something that I felt for my teammates on the field tonight. It's really a testament to how much we've gone through and how we've stuck together. It's a beautiful thing, beautiful thing to be a part of. Very, very happy; we're going to let this marinate and get back to work because we have a lot of climbing to do." On his relief to get the first and second goals, Sapong said, "We were relieved but we knew that wasn't the end of the fight. We've gone in front before this season. It was good to get that goal late, and it came from our pressure, that's something we've really harped on this season. To get it that way was good for us. We knew it would be a tough next 15 minutes. We battered down the hatches, [Andre Blake] came up with some amazing saves and we got out with the win." 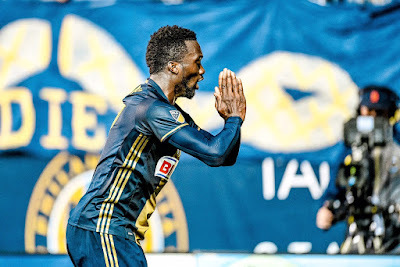 Sapong said of his first career hat trick, "Honestly, you get on the field and given the road that we've been on this season, at this point, we're trying to forget everything and just play. To score it in that fashion when I'm just trying to get into a zone and work together with my teammates, that's the best way. You never go out and expect to score a hat trick, but for me to know that I can have an impact for the team, to hit a career milestone as well, I'm happy, at least for this week." The Red Bulls fall to 5-5-1 on the season, and return home next Sunday for the Los Angeles Galaxy to start a three-game homestand. Red Bulls Head Coach Jesse Marsch said of the match, "Well, the result is incredibly disappointing. I just told the team to make sure we weren't hard on Aaron Long and the defense because the game was lost by our inability to take advantage of chances that we created and really good chances. We haven't been on the road and created these kind of chances in a long time. Not sure why we are not able to finish off our plays and not score as many goals as we need to. We've got to figure out a way now to get more leads, capitalize on more chances and that's going to take pressure off our defense. First half I thought was pretty good and up until 1-0 was really good in the second half. We were pushing the game really well, we were on top of things, Luis had to make one save with Sapong on a header but other than that the game was totally under control. It's crazy to walk out of here 3-0 but we've got to stay strong, we've got to know we've still got a lot of good things happening here and we've got to push harder now when we get home for three straight." Mike Grella returned to the Red Bulls lineup for the first time since a March 19th match against Seattle, and entered the game as a second-half sub.